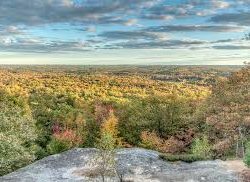 Royal River Conservation Trust has helped to expand the conservation land around Bradbury Mountain State Park five different times in its history. Furthermore, we helped to fund a wheel chair accessible trail to the picnic area and the playground in the summer and fall of 2018. We work closely and cooperatively with the park. From the summit we can see a lot of the conservation land around Bradbury. Come join the fun and enjoy the views. 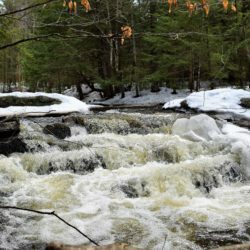 Thursday, May 9, 2019,10 am, Big Falls Preserve GPS Address 381 Woodman Road, New Gloucester ME. Big Falls Preserve is a 40 acre preserve at the northern-most end of Woodman Rd, straddling the New Gloucester town line and Auburn city line. Donated to RRCT in December of 2018, RRCT is working on improving trails and trailheads this spring. The preserve features a scenic waterfall at the mouth of a small wading pool creating a destination for hikers on a 1.5 mile loop trail. 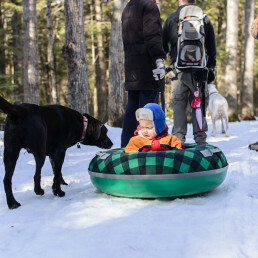 Thursday, May 16, 2019,10 am, Skyline Farm, GPS Address: 95 The Lane, North Yarmouth ME. Skyline Farm is a non-profit organization that maintains a sleigh museum and trail network on a 54 acre historic farm property. 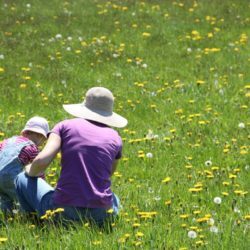 Royal River Conservation Trust holds the conservation easement that protects the fields and woods around Skyline Farm. 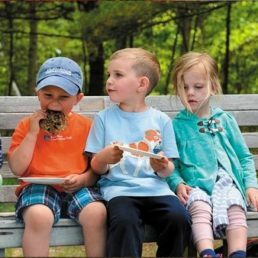 RRCT also holds a summer celebration at Skyline Farm which is family friendly and a lot of fun. Join us for a short hike on the trails, a romp in the field and you can learn more about RRCT Celebrates! as well! 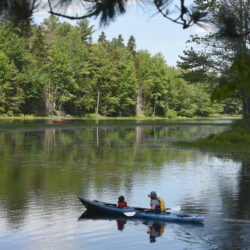 Thursday, May 23, 2019,10 am, Runaround Pond & Chesley Meadows Preserve, GPS Address: 315 Runaround Pond Rd. Durham ME. Runaround Pond’s conserved landscape in Durham includes 374 acres of conserved land. This is comprised of RRCT’s Chesley Meadows Preserve, The town of Durham’s Runaround Pond Recreation Area, and Old Crow Ranch – a conserved working farm and nearby conserved pasture. The walking trail is wide and flat and generally suitable for baby carriages and gentle walking. Small and large loop trails allow exploration of the shoreline of the pond and the shoreline of Chandler Brook. The large loop trail is .6 miles. 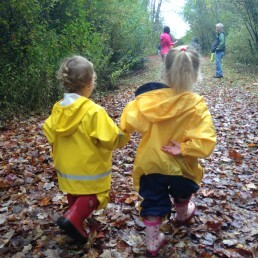 The Rain or Shine Club offers a family-friendly and new-neighbor-friendly introduction to our favorite places with a focus on our active land stewardship projects. Learn how and why we work to protect land, and to protect and develop access to land. Each week we celebrate our successes with a variety of guided and self-led tours. Please join us Thursday mornings at 10am for a well-planned, no-cost adventure. Outings are typically an hour or two long. This five minute video describes the program and experience from one family’s perspective. We head out rain (or snow, or wind…) or shine! Please be mindful of the weather, and bugs, and dress accordingly. Bring appropriate gear, snacks, and thermos or water bottle. Well-behaved dogs are usually welcome with a leash and bags. Check this site regularly to stay updated. Any updates or changes to an event will be posted here by 7 am on the day of the outing.